The oval and slightly flared sides formed as a series of intersecting fluted hoops and with 3 rows of cast silver flower heads, one applied at each junction. 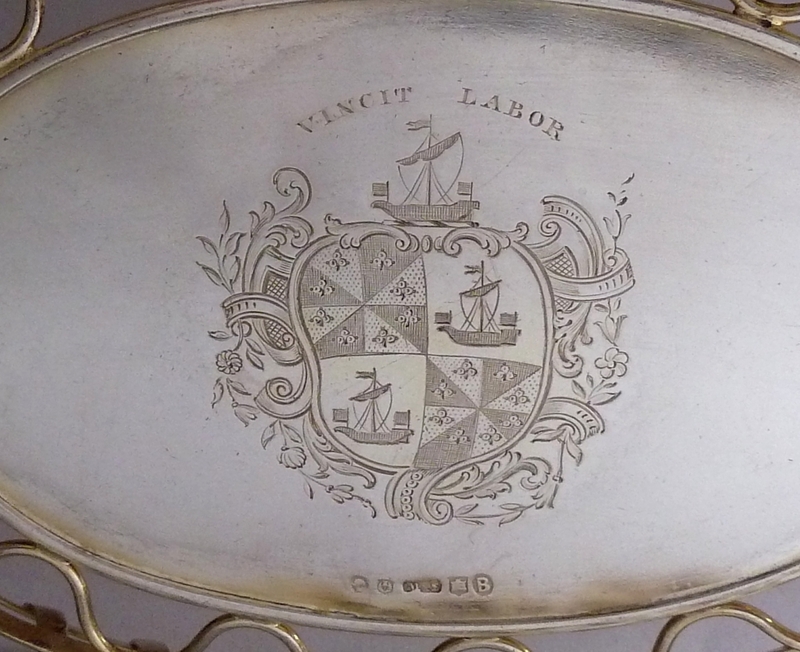 The plain oval base set within a wavy open wire frame and with finely engraved arms in the centre. 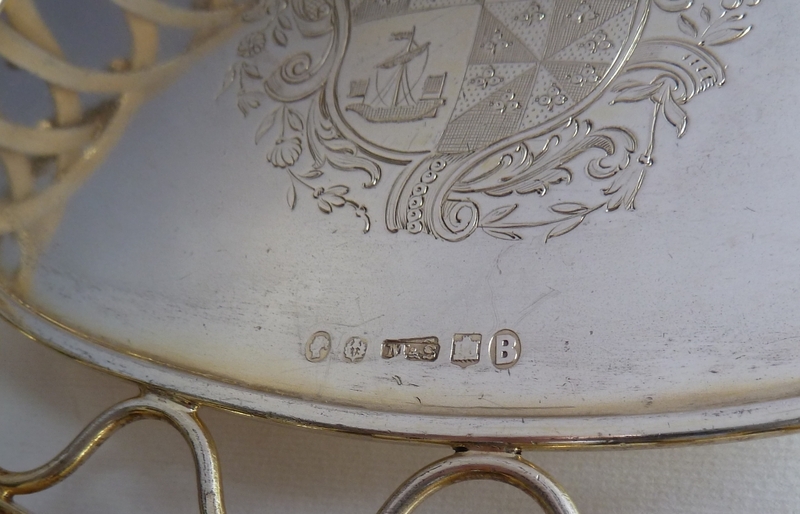 Each end applied with a rope twist handle and the underside engraved in facsimile with "Walter". 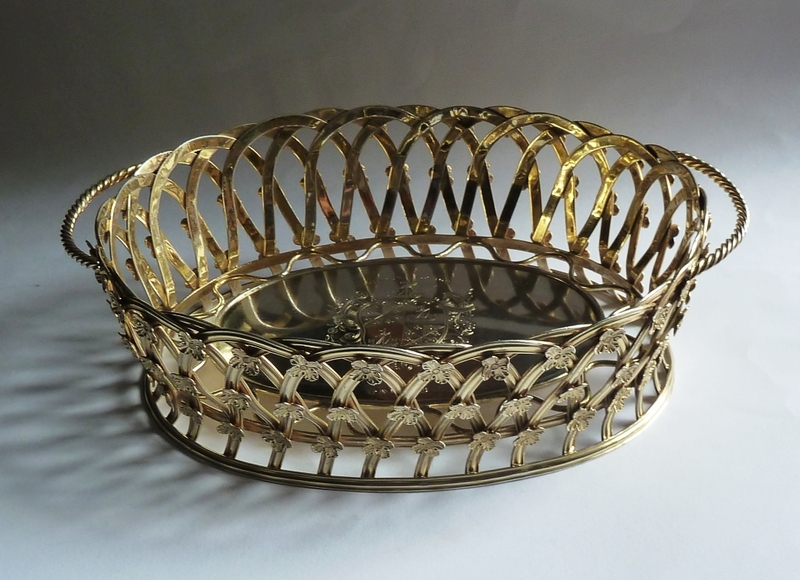 The idea of using fluted intersecting hoops goes back to at least the reign of Queen Anne as seen in a pair of Baskets by John Eckfourd dated 1703 and sold by Sotheby’s on 10th July 1980, lot 399. 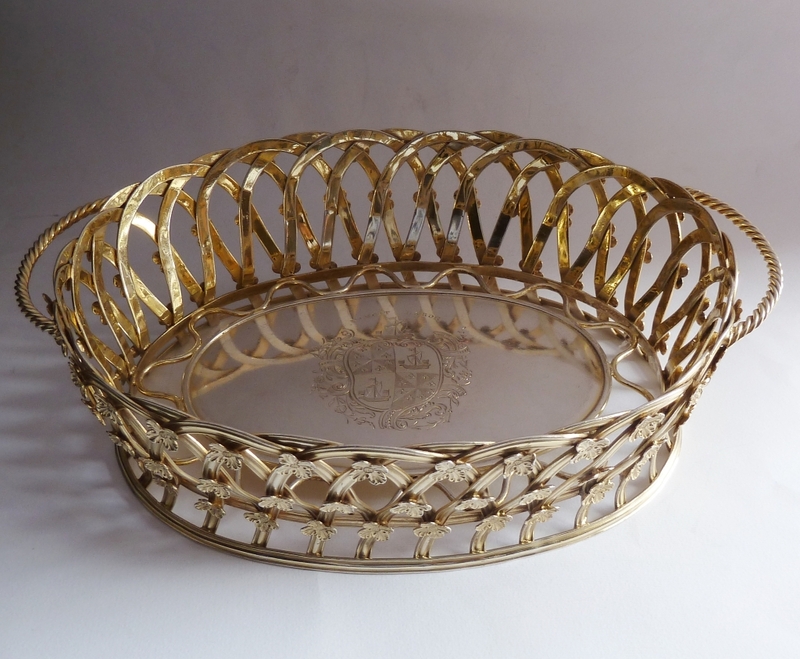 This idea flourished in the late 1720’s and 1730’s with eminent silversmiths such as Paul De Lamerie, George Wickes, Thomas Farren all producing oval 2-handled baskets in this manner. Mssrs Parker and Wakelin developed this style further in the 1760’s by applying fruiting vines to similar intersecting hoops (see Christies, Magnificent Silver from the Collection of the late Hilmar Recksten, 22.5.91, lot 37). 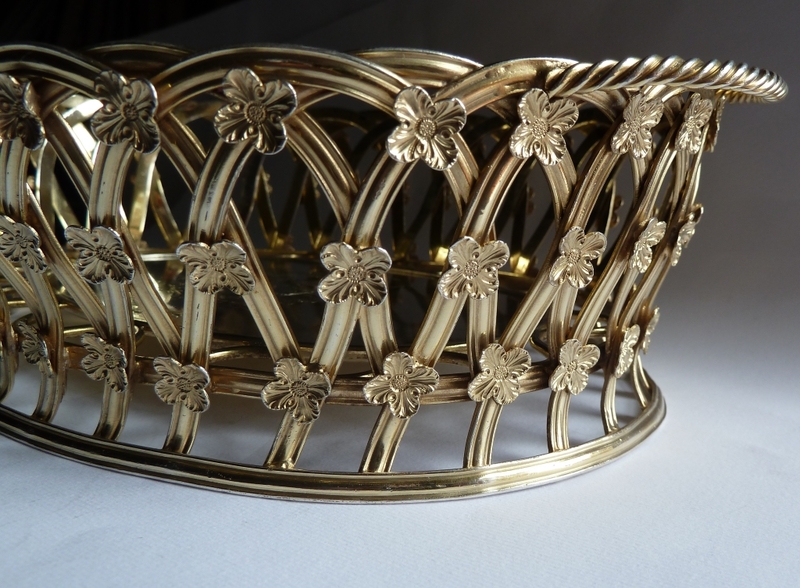 This Scottish basket is superbly made with 96 flower heads applied in 3 rows and the whole delicate and light nature of the piece is cleverly enhanced by attaching the base to an open wrigglework wire. Furthermore the intricately engraved arms, encased in rococo style mantling, add to the overall richness of the basket. Marshall and Sons, based at 87 George Street, Edinburgh were an old established firm of silversmiths and jewellers whose roots went back to the early 18th century. They exhibited at the Great Exhibition in 1851 and were taken over in 1891 by Brook and Son. The arms are those of Campbell of Blythswood, probably for Archibald Douglas who assumed the name Campbell on inheriting the Blythswood estate from his second cousin (also) Archibald Campbell in 1838. The former was born in 1809 and was the 17th Laird of Mains but on the death of his second cousin he gave up the estate of Mains to his brother Colin and became the 12th Laird of Blythswood. 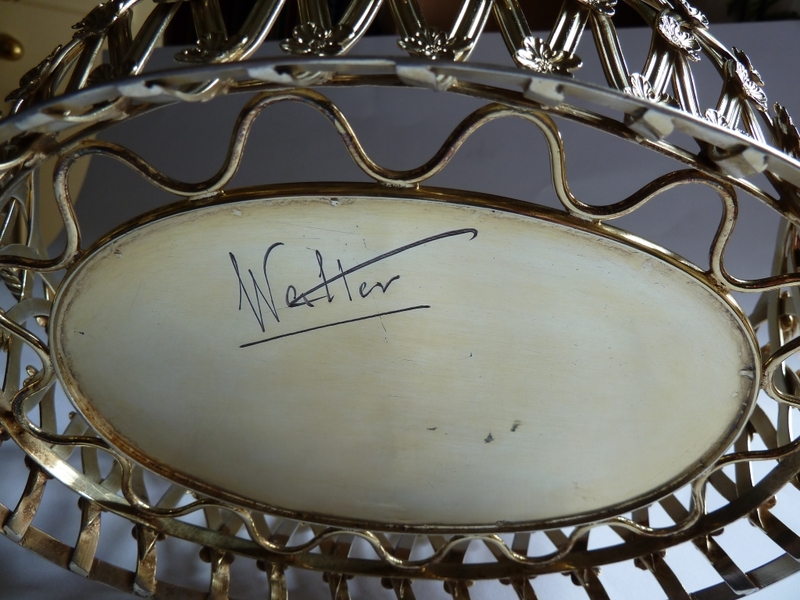 The underside is inscribed “Walter” for Walter Lees. Lees was the son of an Edinburgh Joiner who rose to become a figure of great distinction in post-war Parisian society. In 1939 he enlisted with the Argyll and Sutherland Highlanders and served with great distinction in North Africa where he was awarded the Military Cross. Later he was captured and ended up in Colditz. Immediately after the war he went to Cairo and would have gone on to India but was persuaded to serve as an honorary attaché at The British Embassy under the new Ambassador Sir Oliver Hardy. He mixed in high society with apparent ease but his greatest diplomatic talents were required for the Duke and Duchess of Windsor. Whilst always remaining fervently patriotic to Her Majesty Queen Elizabeth II he dealt with the Duke and Duchess with considerable skill. During this time he befriended the likes of Margot Fonteyn, Hubert de Givenchy, Edith Piaf, Josephine Baker and many more. On leaving the Embassy he became personal assistant to Stavros Niarchos and later to Yul Brynner. He had great taste and was extremely proud of his Scottish roots both of which are encapsulated in this delightful basket.